Paul Brandt is a soldier in the German army who returns home in 1944 having been badly wounded and disfigured. He joined the army after being arrested and given the choice of joining up or facing prison. His village seems a very different place and nearby he finds that a ‘rest hut’ has been built for the SS soldiers who work in concentration camps. The hut is staffed by women prisoners and when walking past one day, Brandt recognises one of them as the women he was with when he was arrested and the reason for that arrest. Recognising that the end of the war is approaching, Brandt determines that he will help the women make it through to the end of the conflict safely. This was an exceptionally well-written book which is both moving and compelling. It is unusual in that it focuses on a German soldier and one who clearly had a conscience. It is easy just to think of all the German soldiers as cruel and heartless but of course, many were just young boys who didn’t want to be fighting but didn’t have much option. The author shows that not just Brandt but also many other German soldiers tried to follow their conscience as much as they could. Brandt wasn’t portrayed as whiter than white, he certainly had his faults, but his basic goodness was clear and his desire to atone for some of his actions in war through helping the women was evident. Yet the author doesn’t shy away from showing the completely inhumanity shown by some of the German officers to their prisoners and indeed fellow soldiers. It was disturbing to read of the heedless cruelty dealt out by some officers and to know that this would be just a glimpse of some of the atrocities carried out by the Nazis. On the other hand, the humanity shown by people who were at their lowest and seemingly least able to offer help was very moving. The Constant Soldier tells a very different story of the Second World War. At times it seems bleak, that there can be no hope for Brandt and the women he is trying to protect. At other times, it shines a light on the best of the human spirit. 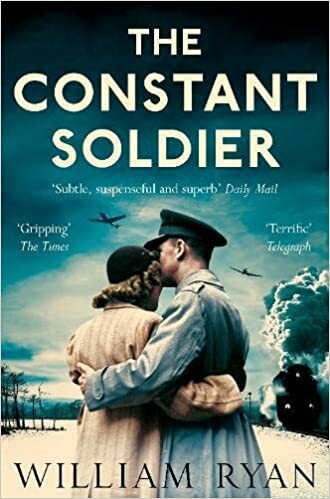 The Constant Soldier is a beautifully crafted novel, emotive and thought-provoking, which captures perfectly the bravery and endurance of its central character in a gripping and atmospheric narrative. Great review Joanne. Keep hearing wonderful things about this book, I must get round to reading it! It really is excellent Abbie.